For cooler fall days, this Breast Cancer Awareness Shirt is ideal! Rock this unique football design at your next fundraising walk and show everyone just how dedicated you are in the fight for a cure. Breast Cancer Awareness Shirts come long sleeved and from our premium 100% cotton preshrunk shirts, machine washable in youth sizes S-L & adult sizes S-2XL. Free personalization of any name is included. Additional Info Get this special shirt as a gift for your walk team for your next Breast Cancer Awareness Walk. Everyone will love the football design and the message that this disease can, in fact, be "tackled" and defeated. 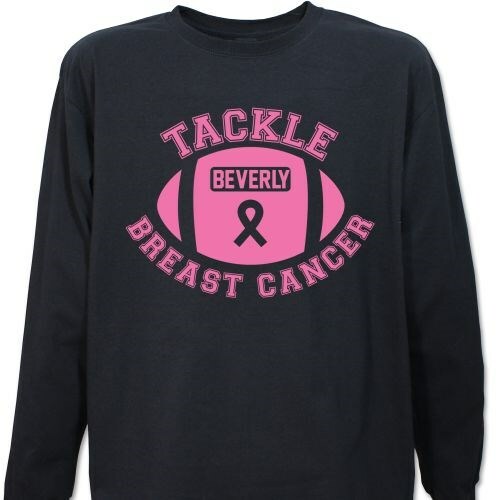 Our Tackle Breast Cancer Sweatshirt is another cozy alternative.